There are certain items that make me instantly think of the holidays. From freshly baked chocolate chip cookies to pine trees, these scents bring me back to memories of my youth. Now, that I'm older, I love the smells, but sometimes I can't have the items with them. An oven full of cookies will bust my diet and real pine wreaths create havoc with the kids. So, what's my solution? A delightful candle from Crafted Candles. 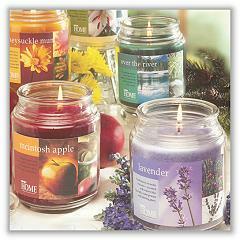 Crafted Candles offers a huge selection of candles. From Winter candles, with the aromas that I remember, to decorative tapers that would be perfect for a table centerpiece, I can find that candles that I need in a single location. As I explored the website, I looked specifically for fragrant candles, preferably one in a jar. I like these types of options because I can place the candle above my sink. That location allows for the scent to pass around all of my living spaces. Plus, I don't have to worry that my kids might accidentally touch the burning candle because it is out of their reach. With the holidays quickly approaching, I'm placing my orders for candles now. I want to be prepared to have a warm and inviting home for my guests. The fragrances that I am choosing are Spiced Swizzle Stick and Balsam Fir. I think that these fragrances will be delightful in my home. Plus, maybe my guests might think that I baked the cookies instead of buying them this year. Crafted Candles offers 20 different varieties of jar candles. Each candle lasts for over 100 hours. At just $12 a candle that is a great value. These candles can be purchased by the case too, which could make for easy hostess gifts or extra on-hand gifts for the unexpected gift giver during the holidays. For Crafted Candles Facebook Fans, you can get an exclusive discount code. Please visit the Facebook page for additional information. Since it's the holidays, Crafted Candles wants to give you MORE! Here's your chance to win a big prize package. One lucky winner will receive $100 credit to pend at Crafted Candles (can be applied to shipping as well). Good luck to everyone and enjoy the aromas of the holidays! Disclosure: This post is sponsored by Crafted Candles and powered by Couponista Queen. The Ariana Mercury Glass Votive Candle Holder. I have a thing for mercury glass!